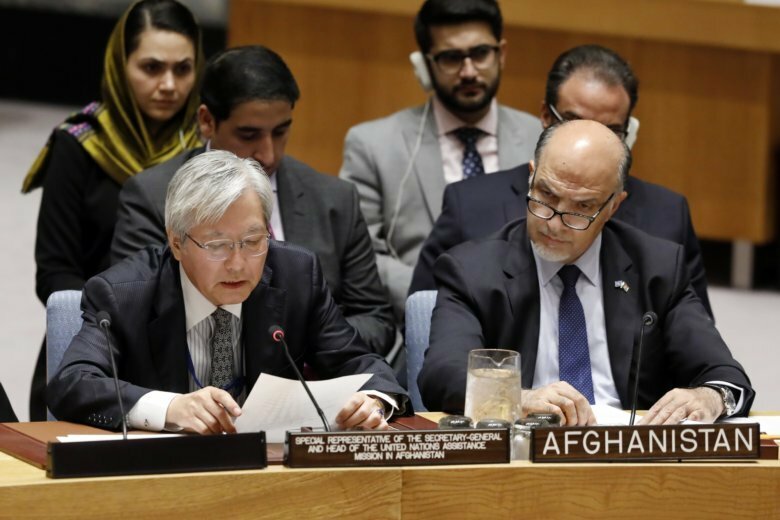 UNITED NATIONS (AP) — The U.N. envoy for Afghanistan said Monday that the war-torn country is in its best position since 2001 to start the process leading to peace talks with the Taliban. He said Afghan government efforts, “which we hope would be reciprocated by the Taliban,” need to be reinforced by regional and other key countries — and by confidence-building measures that could include prisoner releases and technical assistance in contested areas on agriculture, education and health. Taliban officials said last week they are ready for a second round of talks with the U.S., possibly this month. Yamamoto said he remains very concerned about security and political challenges to Afghanistan’s first parliamentary elections since 2010, scheduled for Oct. 20. The United Nations is also aware “of real fraud which might take place, as well as allegations of fraud which may have the tactical purpose of discrediting already difficult elections,” Yamamoto said. He said the elections, plus the presidential vote set for next April, will be a test for Afghanistan’s young democratic institutions. The Independent Election Commission, which is in the lead, will be looked on to perform with “the highest degree of integrity, professionalism and with full accountability to the Afghan people,” he added. While the Taliban has said it is ready for more talks with the U.S., both the U.S. and Afghan governments have insisted that negotiations on Afghanistan’s future be Afghan-led. Direct talks between Washington and the Taliban are viewed as a stepping stone toward Afghan-to-Afghan talks. “Whatever setbacks may lie ahead, we are in a better position now than at any time in the past 17 years to commence the process which would lead to talks for a negotiated end to the conflict,” Yamamoto told the council. An upsurge in attacks and the highest civilian casualty toll ever recorded by the U.N. in the first six months of 2018 underscore the difficulties Afghan forces face in trying to secure the country on their own. The Afghan forces have struggled to combat both the Taliban and an Islamic State affiliate since the U.S. and NATO formally ended their combat mission in 2014. Afghanistan’s U.N. ambassador, Mahmoud Saikal, said the government is “keenly following” the envisioned U.S. talks with the Taliban. “Lately, through increased diplomatic engagement with various partners, we have strengthened regional and international consensus in support of peace efforts,” he said. For nearly 25 years, Saikal said, “Afghanistan has turned into the site of what I term a ‘geographical genocide target’ of certain circles within our region,” which he didn’t identify. He said regional and international support for the Afghan-led peace process “is vital” to its success.